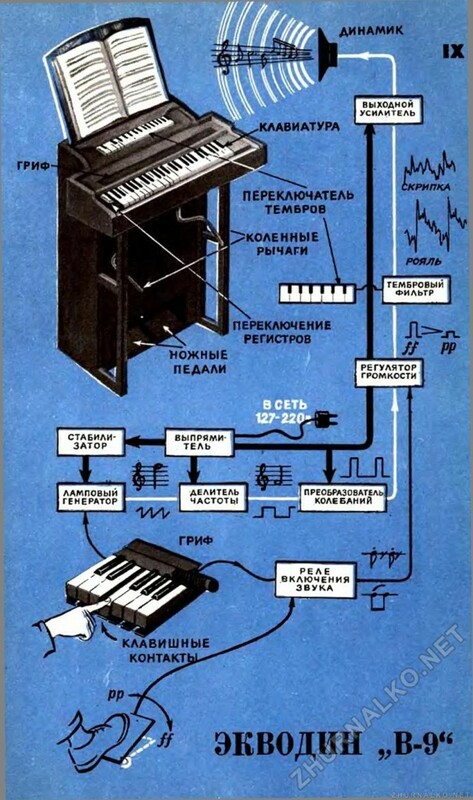 The Ekvodin was a pioneering electronic synthesiser designed by the Russian engineer Andrei Volodin with Kovalski Konstantin and Yevgeny Murzin (later to invent the ANS synthesiser). The first versions of the Ekvodin were home-built experimental models that eventually became successful commercial keyboard instruments, used extensively in Russia throughout the 1940’s until the 1950’s. The Ekvodin won gold medals at the 1958 World Fair in Brussels and the Exhibition of Achievements of the National Economy in Moscow. By the 1970s, Andrei Volodin was teaching musical acoustics and sound synthesis at the Moscow State Conservatory, continuing research and development of the Ekvodin synthesizer and a new polyphonic instrument that was never finished. 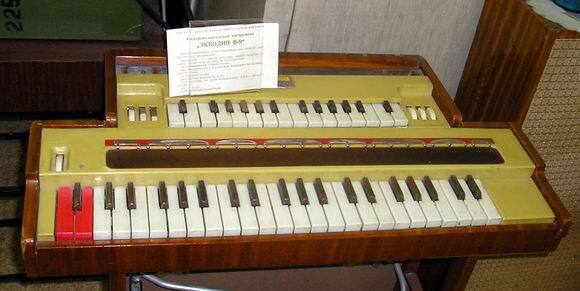 Designed and built by the Russian inventor Andrei Volodin (1914-1981) the Ekvodin was a sophisticated and versatile electronic keyboard instrument. The instrument was unique at the time in allowing the player a high level of control over the timbre and shape of the sound. Apart from the standard keyboard manual the player was given extra control with various knee levers, sliders and foot pedals. The player could add vibrato effects to the note by manipulating the pressure sensitive keyboard directly. The instrument was also one of the first instruments to include what would become a standard feature in much later synthesisers, a bank of preset sounds which was said to accurately imitate musical instruments of the symphony orchestra including percussion. Volodin continued developing the instrument throughout the 1940s which culminated in a commercial model in the 1950s. However Volodin’s instrument was at the mercy of the Soviet Government who decided to stop funding the project in the mid 1960s after only twelve of the instruments were sold. Volodin continued research into musical acoustics and teaching at the Moscow State Conservatory as well as privately developing a polyphonic version of the Ekvodin and other electronic instruments, none of which were ever built. EKVODIN is a professional musical instrument intended for universal use in various ensembles and orchestras and for solo performances including concerts with the accompaniment of piano and other instruments. The EKVODIN is suitable for different musical genres.The sound is produced in the EKVODIN on purely electrical principle. The instrument is noted for wide variety and brightness of timbres, broad range and high limit) power of the sound, and also for rational and highly-developed system of reproduction means (vibrating keyboard, loudness pedals, portamento, etc.). This ensures expressiveness and accuracy of performance. The profession of a piano player is closest to that of a man playing the EKVODIN. This similarity, however, does not determine the application of the EKVODIN which is, first of all, an ensemble and orchestra instrument.The EKVODIN comes in two design versions : one-voice and two-voice versions. A thoroughly developed system of timbres, varied with the aid of a special switch (and also depending upon the methods of performance), makes it possible to obtain an expressive and pleasant sound. The EKVODIN imitates quite fully the sound of symphonic orchestra instruments (bow, wood and brass groups, as well as certain percussion and pizzicato instruments) and also folk instruments. The EKVODIN allows to obtain sound personality in new timbres of modern style. The instrument can be used in mixed ensembles and orchestras for supporting and emphasizing different groups of solo parts performed on the usual (mostly string and brass) instruments, when their natural power is not quite sufficient for overruling the orchestra and for creation of new sounds. In incomplete orchestras and ensembles the EKVODIN can handle practically any part (the two-voice will handle two parts) of the bow, wood or brass groups. A special ensemble consisting of EKVODINS allows to obtain, for a very small number of instruments (sextet or octet), a multifarious, fluent and high – power sound in original and common timbres.Both design versions of the instrument come in semi-stationary (dismountable-transportable) construction and high-class finish. The extension loudspeaker unit, supplied with the instrument, can be located independently up to a distance of 5 m. The loudspeaker unit is installed depending upon the location of listeners. When carried or transported from place to place, the instrument is packed in two units of suitcase type. For operation the instrument is connected to alternating current mains (127 or 220 V). The EKVODIN is not sensitive to fluctuations of the mains voltage. The one-voice version weighs about 35 kg, and its power consumption does not exceed 90 VA. The output power of the sound channel reaches 10 V. The two-voice version weighs about 65 kg, and its power consumption does not exceed 200 VA. The output power is up to 10 Win each channel, the timbre setting being independent for each voice. To double the. power of solo parts and timbre effects the voices can merge in unison, octave and two octaves. Volodin, A. “Generation of sounds controlled by the force of the blow on the keys of electronic musical instruments (Electropiano),” Invention certificate, No. 66, USSR Cl. 154 (1946). Volodin, A. “Acoustical-psychological aspects of the evaluation of musical sounds,” in Proc. of the 7th USSR Acoustical Conference (L., 1971). Volodin, A. “Electrical synthesis of musical sounds as a basis for research on perception,” Voprosi psychologii, No. 6, p. 54-69 (1971). Volodin, A. “Multifunctionality of the formants of musical sounds,” in Proc. of the 8th USSR Acoustical Conference (M., 1973). Volodin, A. “Perception of vibrato in musical sounds,” in New research in psychology and age physiology, No. 2 (M., 1972). Volodin, A. “Psychological aspects of the perception of musical sounds,” Candidate dissertation (M., 1972). Volodin, A. “Perception of vibrato in musical sounds,” in New research in psychology, p. 3-5 (M., 1974). Volodin, A. “The role of harmonic spectrum in perception of pitch and timbre,” in Musical Art and Science, issue 1, p. 11 (M., 1970).